name 5 things. : Gorgeous Nursery: Round 2. My friends David and Emilia did an absolutely amazing job on their baby Bea's nursery. At the time they first posted pictures of Bea's room, she hadn't yet made her big debut. I am happy to report that sweet Beatrice Lolly made her grand appearance on Friday! On to Bea's nursery, which I know she will love once she's home. I love how they went with blue paint on the wall for a girl's room. I wouldn't have ever thought to do that, but with all of the other feminine touches, this room is absolutely perfect for a girl. Emilia said her goal was to have a girly-vintage feel, and I think she totally achieved it. The sweet sentimental touches of the pink frames on the gallery wall (which includes a valentine that Bea's great-grandfather gave her great-grandmother) and the precious dresses (which were Emilia's mom's) above the crib are perfection. And how great are those stripes? Love that they pained the closet door too! Check out those fabulous Anthro knobs on the changing table/dresser. Aren't they fun?! This corner of the room is one of my favorite parts. The vintage bookshelf was found at an estate sale and the adorable mirror was a Goodwill find! They are both perfect for that space! And how amazing is this lamp that Emilia found? I love it! She bought two of them for when Bea and her big sister, Ruby, share a room. How sweet is that? I'd say sweet Bea is one lucky little girl to have such a fabulous space. Go check out their blog where Emilia shares more details of the room. Oh, and you should also check it out because their other daughter, Ruby, is just about the cutest little girl I've ever seen. Love this nursery. Love the stripes, and definitely love the old mixed with new! so cute and I love all the sentimental touches! 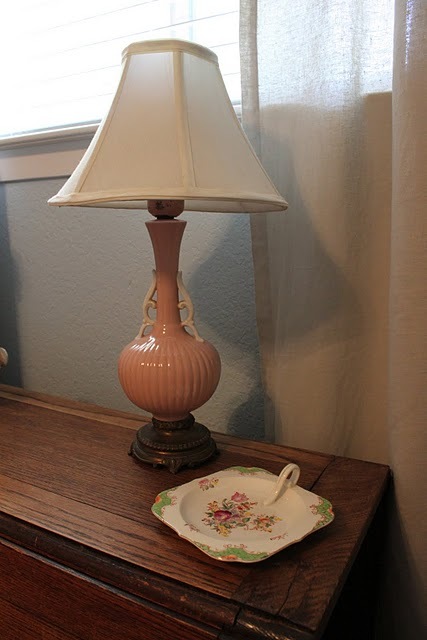 Love all the vintage pieces and the sweet sentimental touches too! The blue is so calming and looks so great with all the feminine touches! So pretty. 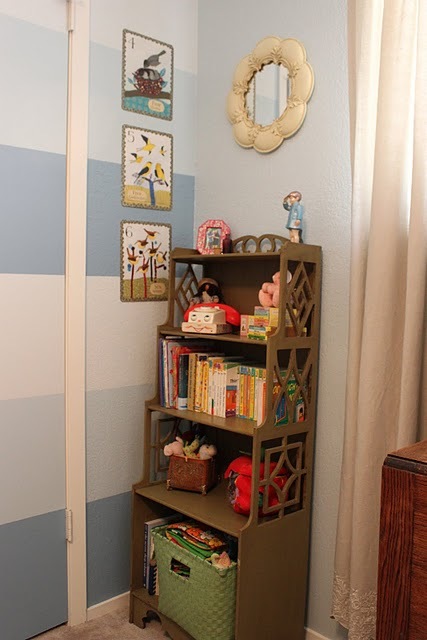 I never would have thought of painting a little girl's room blue either, but it is perfect for the space. This room is precious! Love every single detail! Kindle Case + A Winner. Happy 1st Day of August.